Welcome to the Starter Level practice plans. 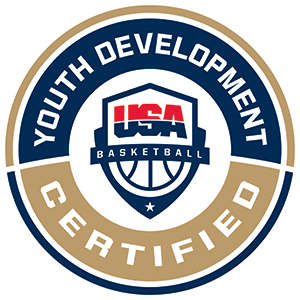 At the Starter Level, the fundamental skills will be honed and expanded upon while the players develop an understanding of what it means to be a part of a team. Confidence comes mostly from hard work. If players know they have put all they can into preparing, they will feel much more confident come game time. Even in practice, going as hard as they can on every drill and in every scrimmage lets them feel their improvement and have a sense that they are earning their success. The more they see hard work paying off – even in small advances – the more confidence they gain and thus the more willing they are to put in even more toward the next level of advancement. Walk around the court with the players and identify spaces on the court (half court, 3-point line, sideline, and more). Have the players repeat the names of each area you identify. Choose from the movements below to provide the players with a movement to get to any space you choose to identify. Announce both the way to get to the line or area and the line or area. Movements to choose from: Forward March, Backward March, Lateral March, Forward Skip, Backward Skip, Lateral Skip, High Knees, Backward Run, Quick Feet, Side Push. Teach the players about the court while also teaching them proper execution of fundamental movement skills. All players need a basketball (or share) and should stand on the sideline. Players should be in a stance with their legs bent. The players will dribble the basketball with each finger on their hand. Each dribble will be with a different finger focus. The first dribble will focused on using their thumb and will then progress to using their pinky finger and back for 30 seconds. This drill works on good control dribbles using fingertips. All players need a basketball (or share) and should stand on the baseline. The players will get 5 seconds to dribble the ball with their right hand. The players will then get 5 seconds to dribble the ball with their left hand. The last 5 seconds the players will get to dribble creatively in any way that they want. This should be a fun drill that allows each player to be creative with the ball. Have players get into balanced groups and line up on the baseline. The first player in each line should have a ball. Have the players run while dribbling with their eyes up to the opposite baseline and back. When they get back have them give the ball to the next person, give them a high five and go to the back of the line. Players should do this 2 times with their right hand, 2 times with their left hand and 2 times with the crossover dribble. Encourage the players to gain comfort and push themselves to run fast and control the dribble at the same time. Have the player get in groups of 3 standing in a triangle with one basketball. 1 player will have the ball facing away from the other two. The two players without the ball will determine 1 player to make eye contact with the player with the ball. The player with the ball will then jump and turn around to face the two players and locate which player is looking at them and has their hands up for the pass and make a quick step and pass. Repeat this action with the new player with the ball. The player with the ball must quickly read and recognize when a player is ready to receive a pass. The other 2 players must quickly decide who will make eye contact. Have the players divide into groups, hold a ball, and stand in a good stance on the baseline. 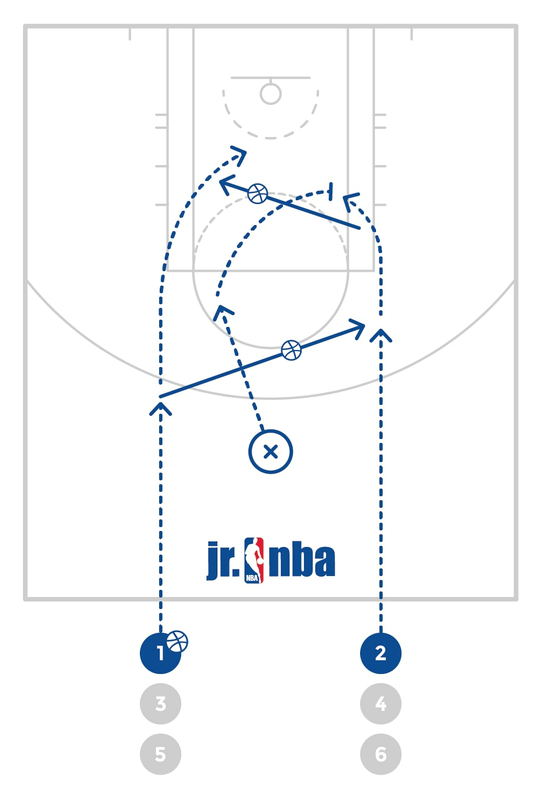 The players will dribble to the free throw line extended and jump stop and then forward/reverse pivots until they are facing their line again. 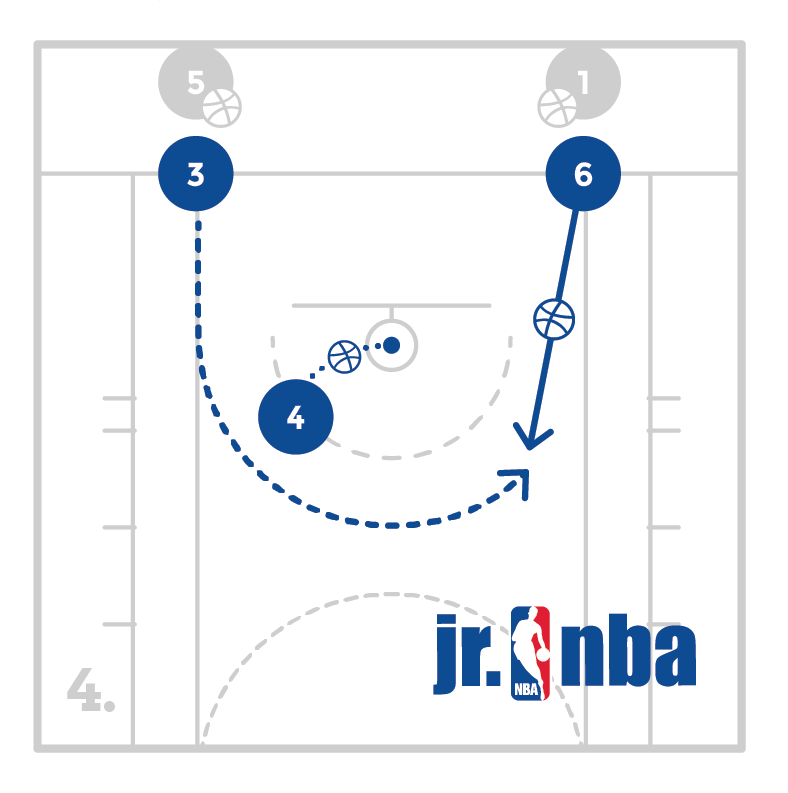 Have the players then pass back to the next player in line and continue the process. Help the players understand the importance of a good jump stop, good on balance pivots, good passes and showing a target. 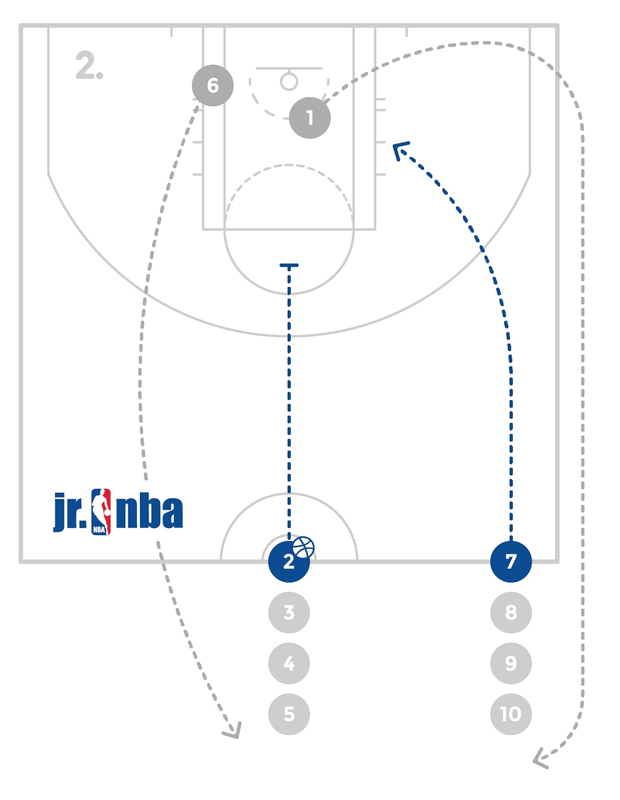 Have the players start on the baseline on the right side of the court in one line. Each player can have a basketball or the first 5-6 players. Set up a cone at the opposite wing on the other side of half court. 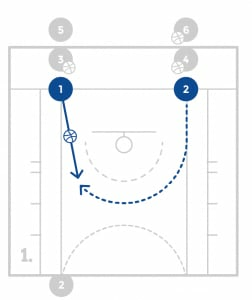 Have the players take 2 jogging dribbles forward and then make a running pass ahead trying to hit the cone. The coach should stand behind the cone and give the ball to the players after their pass. Players will get the ball back and go to the back of the line. Players receive one point each time they hit the cone. Have fun while emphasizing a good long pass and being detailed and precise in hitting a target. Have 2 lines at half court, 1 in the middle and one on the side. The line in the middle has a ball and will dribble to the free throw line, come to a good jump stop and make a good bounce pass to the player running in from the line on the side. 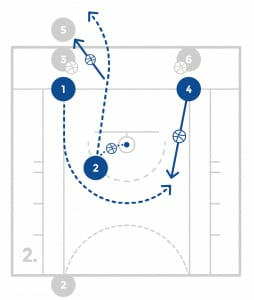 The player from the side line will shoot a lay-up and the passer will get the rebound and the players will switch lines. This will continue for 2 minutes and then will be done on the other side as well. The players should dribble under control and come to solid jump stop to make the bounce pass to a sprinting finisher. Have players partner up and get one ball for the two. The first player will start with the ball on the right wing at the 3-point line and the other player will start about 2 strides behind them designated by a cone. When the coach indicates, the player with the ball will dribble in for a lay-up while the other player will try to run from behind to contest the lay-up. The next pair will start immediately behind them and each group will switch positions each time. Change spots on the court as the players get more comfortable. This drill emphasizes having the players finish layups at game speed with a real defender behind them which forces them to have further concentration. The players will start in two lines facing the court where the lane line meets the sideline. Each line will have two balls. There will be one player who starts on the court on the block. The player with the ball in front of the player on the court will pass them the ball, the player will shoot and get their rebound. 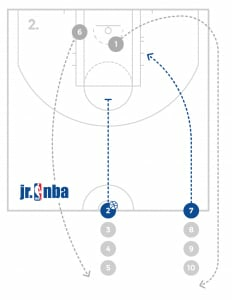 After rebounding, the player will give the ball to the same line they got it from and then go to the back of that line. 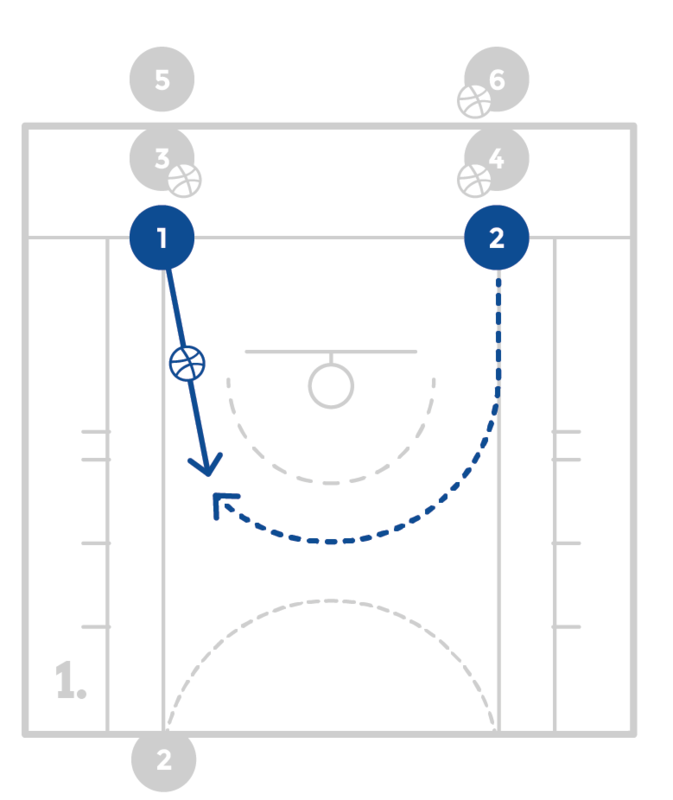 After the player passes, they will loop around the outside of the shooter to the other side of the lane and catch the ball from that line. The player will shoot, get the rebound, give the ball to the line they got it from and go to the back of that line. The player who made that pass will continue the process of looping behind, shooting, and going to the other line. Have the players shoot from different distances from the basket when you dictate. Make sure the players go around the outside of the shooter. Also make sure the players get their rebounds quickly and give it to the line they received the pass from. Have the players divide into as many as 4 groups at shooting spots (wings & slots) and the first player in each line will have a ball. The player at the front of each line should have a ball. 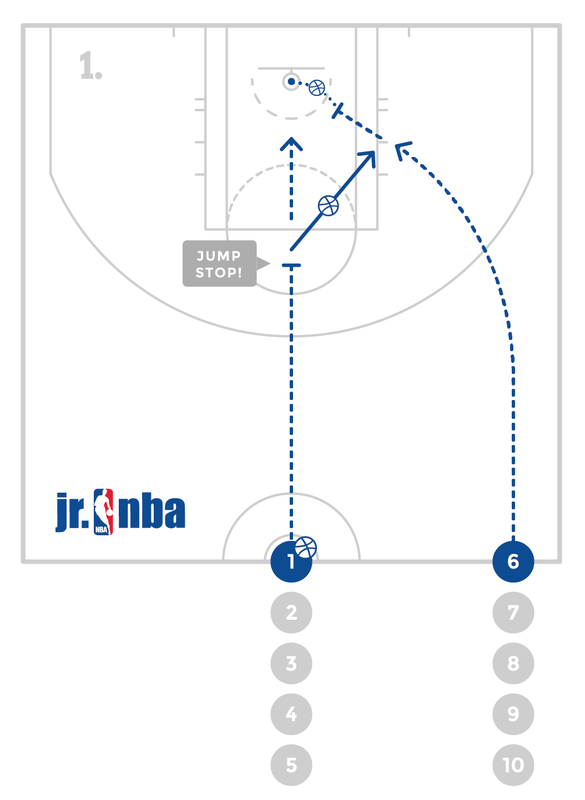 The players will dribble in to the cone setup a few feet from the basket, jump stop and shoot, get their rebound and give it to the next player in line. The first team to 6 made baskets wins. Work on a good jump stop, being balanced and making shots moving at game speed. All players need a basketball (or share) and should stand in an open space on the court. The players will use two hands to toss the ball into the air. The player will move towards the ball, jump and catch the ball at their peak. They will then repeat or give the ball to the partner. It is important for the players to see the ball, track its trajectory and jump and catch the ball at their peak. Start with 2 lines at half court and one line with a ball. Have a defender starting at the top of the key. Have the 2 offensive players attack to try to score in a 2 on 1 fast break setting. 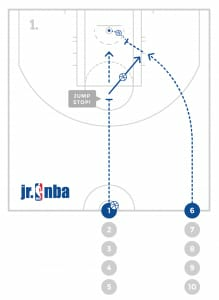 The player who takes the shot or turns the ball over will then become the defensive player at the top of the key. Work on good fast break decision making while also working on good 2 on 1 defense. Assign 2 players to each number and have everybody stand on the baseline. The two players with the same number our teammates and will be playing together. Throw the ball on the court and call out 2 numbers. The 2 players with those numbers will go for the ball and whoever gets the ball will be on offense and the other 2 on defense for 1 possession and 1 shot of 2 on 2. Evenly mix up the numbers you call and the game is over when any team gets to 5 points playing by 1’s. Encourage the players to hustle to the ball and make good team plays to score. Also encourage the defensive team to move their feet, play active defense and contest all shots. Assign all players to a number in groups of 3 and have everybody stand on the baseline. The 3 players with the same number are teammates and will be playing together. The 3 players with those numbers will go for the ball and whoever gets the ball will be on offense and the other 3 on defense for 1 possession and 1 shot of 3 on 3. There is a 3 dribble maximum each time a player gets the ball. No screens can be set but cutting is allowed and encouraged. Divide the players into teams (have substitutes if needed). Play 5 on 5 until a team makes 3 shots. Encourage the players to cut, move the ball and work on all the basketball concepts they have learned. At the conclusion of the Starter Level, Jr. NBA players should be proficient at each of the following skills. Judging proficiency at this level is the responsibility of the coach.